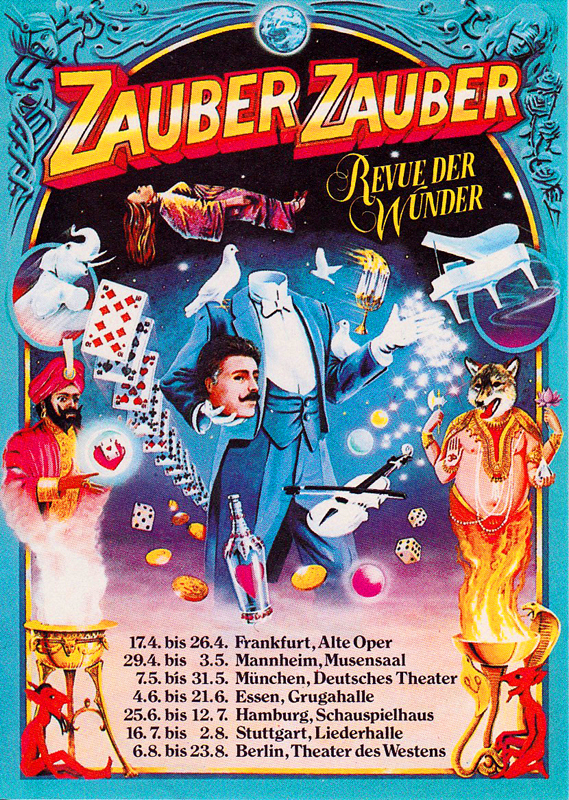 The first “Zauber Zauber” shows were performed in Berlin and Mannheim, Germany, in 1986. Such was its success, that the producers Peter Schwenkow and Thomas Schütte, decided to renew the show with a German tour the following year. This became a six cities tour over five months, in Frankfurt am Main, Münich, Essen, Hamburg, Stuttgart and Berlin. The 1987 program differed only slightly from the previous year. “The great masters of the magic world” were : Alexander (manipulation), Jeff (sound-effects artist), Tina Lenert (lady magician and mime), Milo and Roger (comic, or more correctly, hilarious magicians), Norm Nielsen (manipulation, musical magic), Omar Pasha (magical Black Art), Prasanna Rao (shadowgraphy artist) Marvin & Carol Roy (Mr Electric), Shimada (manipulation), Jacky Steel et Athene (telepathy), Mark Stevens (illusions). The artistic director was André Heller and the show was directed by Winfried Bauernfeind. Everywhere the show’s success was great. In Hamburg, so many people were standing in line before some of the shows that many of the performances started with a delay of 15 to 20 minutes. “Zauber Zauber” was shown in the bigger theaters in each of the cities, and even in some large sport halls. In the following years, the title and the poster “Zauber Zauber” were used again in some German variety theaters. Omar Pasha was part of nearly all those programs.